AKA: 坂本ですが? ; Sakamoto desu ga? Also Recommended: The Disastrous Life of Saiki K.; The Daily Lives of High School Boys. Sakamoto is a literally perfect person- he can do ANYTHING with admirable finesse. If jealous school delinquents try their hardest to harm and/or humiliate him, they not only utterly fail, but themselves end up being "owned" by one of Sakamoto's magnificent performances, which are physical ripostes analogous to Cyrano de Bergerac's verbal sparring against his feckless opponents. 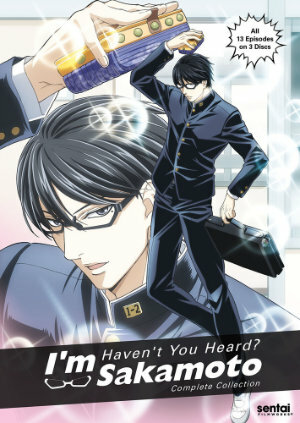 (Being "cool" and mysterious, Sakamoto is a man of action rather than words.) And yet these encounters with Sakamoto, no matter how embarrassingly they backfire on their perpetrators, somehow often still lead to improvements in those perpetrators' own characters. But this is all primarily a comedy, so is it funny? Well, YES, a number of the jokes are just fine; even some of Sakamoto's elegant-but-absurd physical responses to the curveballs thrown at him by the school's delinquents work well enough, but most of the humor arises from those delinquents themselves- and much of the human drama, too, such as it is. (Remember, Sakamoto has NO ARC; he seems exactly the same at the end of the show as he was at the beginning.) The delinquents find their own characters improved by their encounters with Sakamoto, even when their original intention was to sabotage him. It kind of reminded me of the salutary effect Miyazaki's Nausicaa had on everyone she encountered, especially in the manga version of that story- though Nausicaa could make her opponents better people without humiliating them in the process. Of course, it helps that the "delinquents" here are rather softcore, as is usually true in anime school comedies (with one major exception, who I'll get to shortly.) Three of them are Atsushi Maeda and his pals "Mario" and "Ken Ken." There's an amusing recurring bit where we see them from a distance, in a perfect triangular formation, tossing a ball to each other while their conversation grows more and more inane; when it finally goes completely off the rails, they (literally) drop the ball. (Yes, this is funnier than it sounds.) We'll note here that there's a hierarchy among the delinquents (not surprising at all, given Japanese culture), but the person at the top of the heap, named Fukase, is objectively the worst of the lot- or maybe the only REALLY bad one, depending on your point of view- and he rules through persuasion rather than through regular "chain of command", exploiting the psychological weaknesses of the other delinquents. His machinations occasionally do lead to serious violence. There was a nice bit of meta-awareness in Episode 13, though here the show was a little hard on itself, for there really IS some original material in the last ep. The closing ballad was really my favorite part of the whole show; it's lovely. Recommended Audience: There's some graphic violence late in the show; mild violence throughout. No fanservice. Young children should be cautioned that some of Sakamoto's stunts can't be done in reality.